I covered this topic extensively in 2009, but it is a good time for a quick review with everything that is taking place in Cyprus. People assume in the United States that their money in the bank is completely safe as long as they hold it in an FDIC guaranteed deposit. 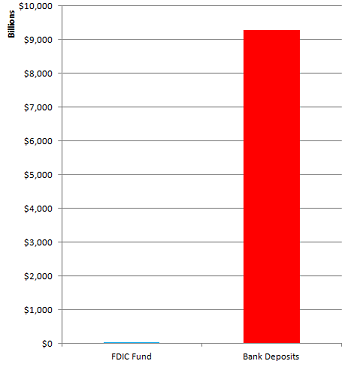 The following graph shows what the FDIC has in reserves (blue line) to back the deposits (red line). It shows that if there was a major bank failure or just a small fraction of the reserves were removed, the FDIC would be out of money in minutes. The actual totals are over $9 trillion in deposits and less than $25 billion in capital at the FDIC. At a point in 2009 the FDIC actually had a negative capital base, which made this story even more laughable (they borrowed from the federal government to stay alive). 1. The FDIC would need to agree to back the deposits. We just discussed that they actually have no money so they would immediately place a panicked phone call to the federal government. 2. The federal government would need to agree to back the FDIC. We have discussed many times that the federal government actually does not have any money. The government runs trillion dollar deficits every year and has a negative $17 billion balance sheet. They only exist due to their ability to borrow. Upon receiving the phone call from the FDIC, the federal government would immediately place a panicked phone call to the Federal Reserve. 3. The Federal Reserve would need to agree to print the money to back the federal government. How much would they need to print? $9 trillion as shown above to cover the deposit base. The following chart shows that the Fed has monetized over 50% of the United States debt since 2009. They are on pace to monetize over $1 trillion this year, which will be more than the entire annual deficit. Remember that if you lend your money to the bank, due to the fractional reserve banking system, that money is immediately removed from the bank and lent out. The FDIC guarantee allows banks to be completely reckless with the deposits. The entire financial system is backed up by confidence. Nothing more. There is no money at the banks. There is no money at the FDIC. There is no money at the federal government. It is a paper trail of I.O.U.'s. Will there be a bank run in the United States tomorrow? Very unlikely. Will there be a bank run at some point in the United States for a banking system that is completely insolvent? It is 100% guaranteed.